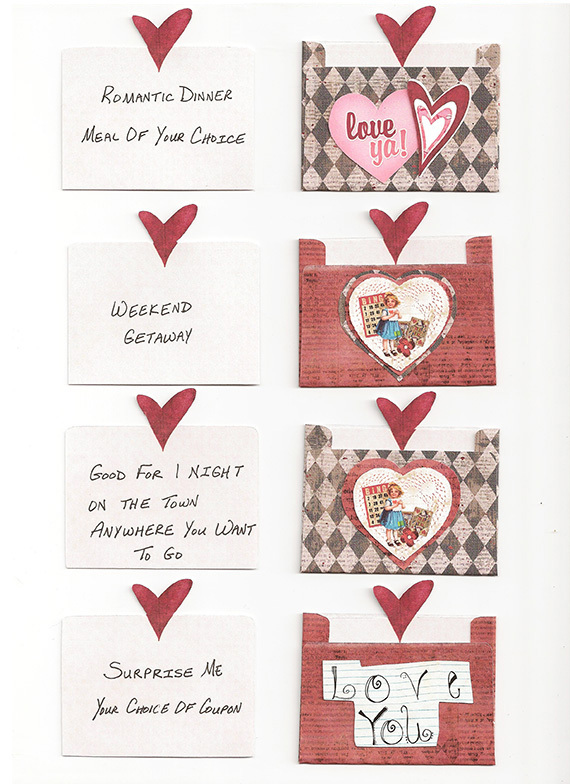 These little hybrid coupon books are so easy to make and can be used for any occasion. 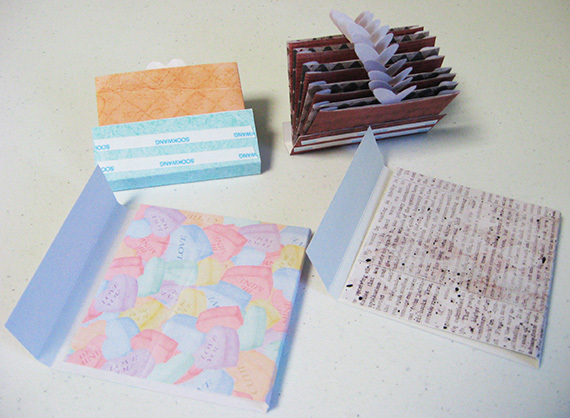 I have created 2 samples for you; one for a child to give to their Dad, and one for an adult to give to their sweetie. 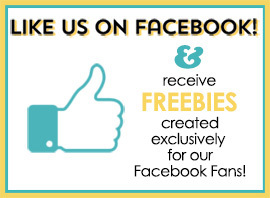 Special thanks to Carla’s daughters for helping me with the coupon ideas for the book for Dad! 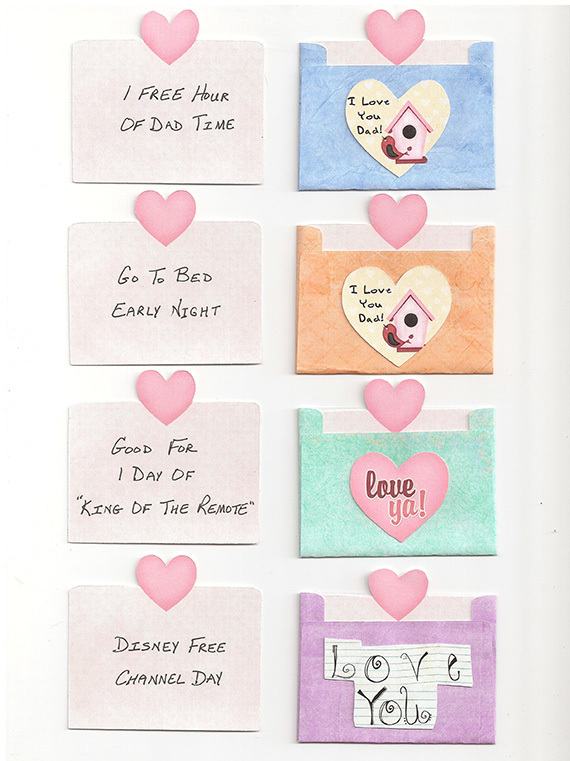 You could also make these for your child; wouldn’t they love redeeming a coupon for a special play date with Mom or Dad? 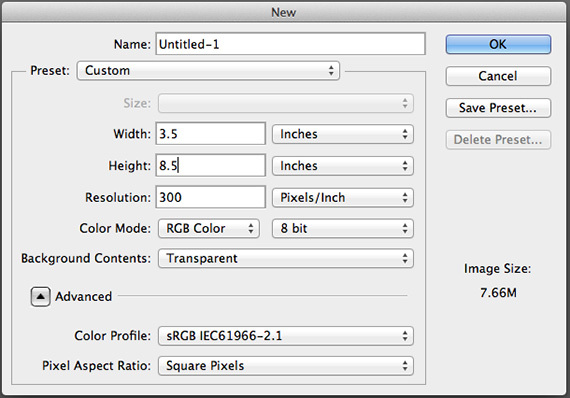 Create a new blank document in your photo editing software Start measuring 8 1/2 x 3 1/2 inches. 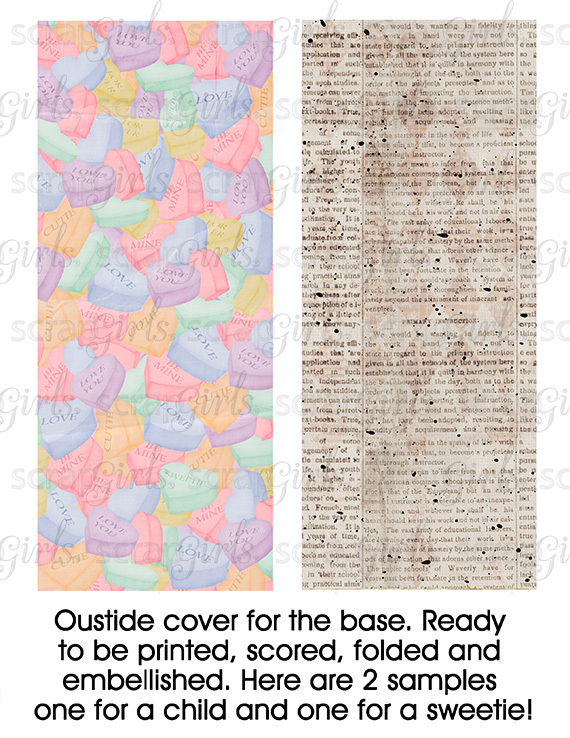 Open up your choice of digital scrapbooking papers and drag these over to your newly created document. 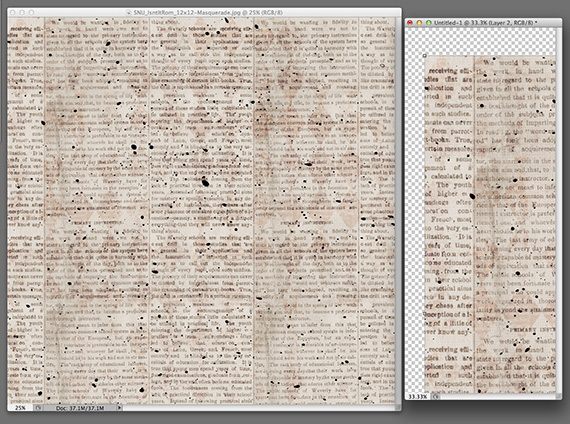 Duplicate and drag over a different paper, if desired. On the long horizontal side score at 3 1/2, 3 3/4, 7 1/4 and 7 1/2 inches. Cut out using a paper trimmer or scissor. 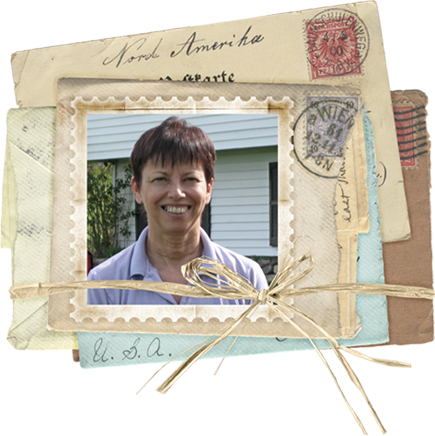 Open Syndee Nuckles’ free Printable Envelope Template Special and cut off the top portion of the envelope and scale to 3.70 inches x 4.07 inches. 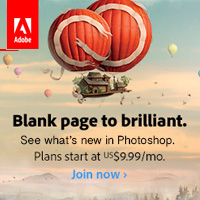 Place the paper you wish to use on the template. 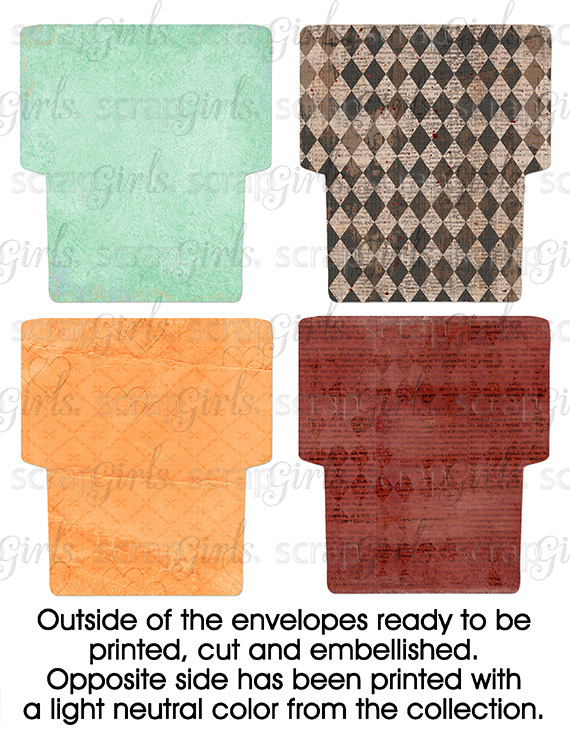 You can get 4 of these envelope pockets on to an 8.5 x 11 piece of copy paper. Print 3 times for a total of 12 envelopes, you will need 10 for your coupon book or you can use all 12 for 2 extra pockets. Fold the envelopes on the score lines, place adhesive on the sides and fold the bottom up to create your pocket. Optional Tip: I used my color picker to choose a light shade from my collection to print on the back of my paper to coordinate with the paper I chose for the outside of my envelope. When you are embellishing the outsides of the envelopes keep in mind that you will be using adhesive on the bottom to join all 10 of the envelopes. You will want to have at least 1/4 inch free of embellishments at the bottom, so that they won’t be covered up by the tape. You also want to keep your embellishing to a minimum so that you don’t add too much bulk to your project. After you have your envelopes and tags complete now you are ready to attach the envelopes together. Take your adhesive and place on the front of each envelope (I used 1/4 inch sticky strip tape) the tape on the bottom edge of each envelope; do this for all 10 envelopes. One additional step for the envelope pocket will be to take the envelope that will be last in your group, add 2 pieces of sticky strip tape to the bottom of the back; 1 near the bottom and the 2nd one no higher than 3/4 of an inch from the bottom. Starting with the bottom envelope remove the tape from the front and attach the next envelope pocket, do this for all of your envelopes making sure to keep them lined up. When this is complete you are ready to create and attach the base for the envelope pockets. The base the coupons fit in should measure 2 x 3.25 inches, score at 1/2 inches and 3/4 inches. 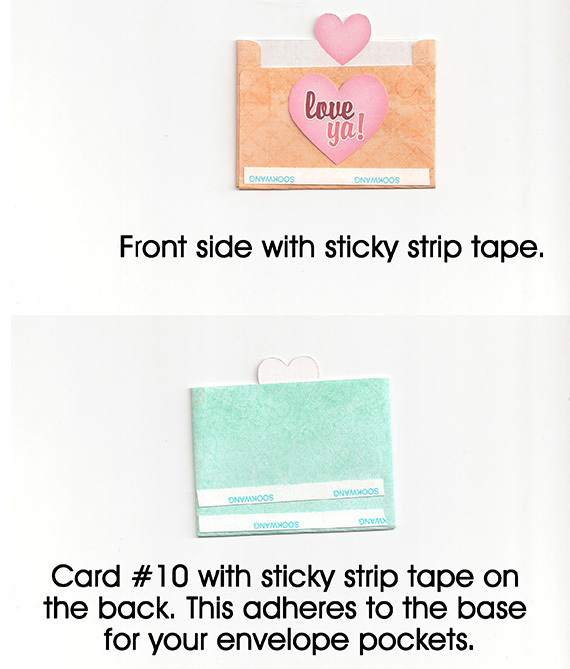 Place your coupon pack in the slot of your base and press to secure the tape. Your last step to complete your book is to add 2 pieces of sticky strip tape to the back of the coupon pack that you just completed. 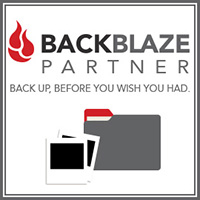 Line up the packet inside the 2 score marks at the bottom of your book base, make sure you are centered and adhere. 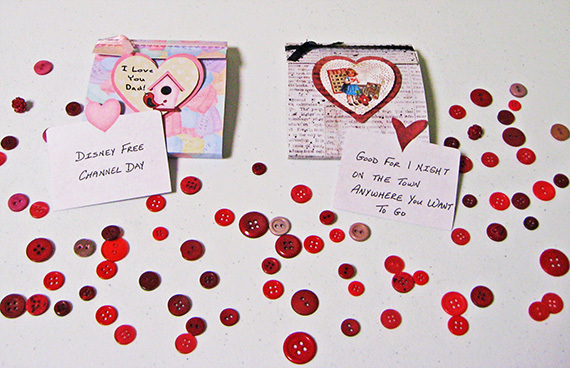 Now it’s time to embellish and finish your Valentine Coupon Book. For the front of my book I created a layered heart embellishment, I put adhesive on the bottom two-thirds of the bottom heart leaving the top third to be used to slip the top flap in back of; I then used a pop dot and added my second heart embellishment. I added ribbon to the top flap to complete my books. Add any additional bling you choose to finish off your coupon book. I hope you enjoyed this tutorial and will give these fun coupon books a try. Please share your projects in the Scrap Girls Hybrid Gallery.